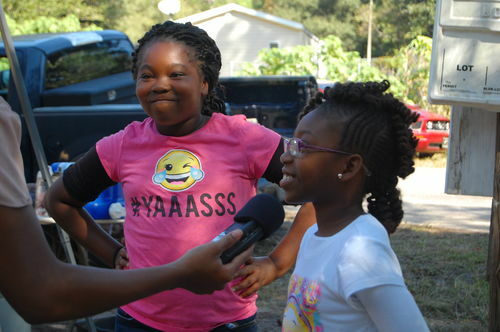 Jasmine and her family closed on their Habitat house in August and are enjoying their new home! 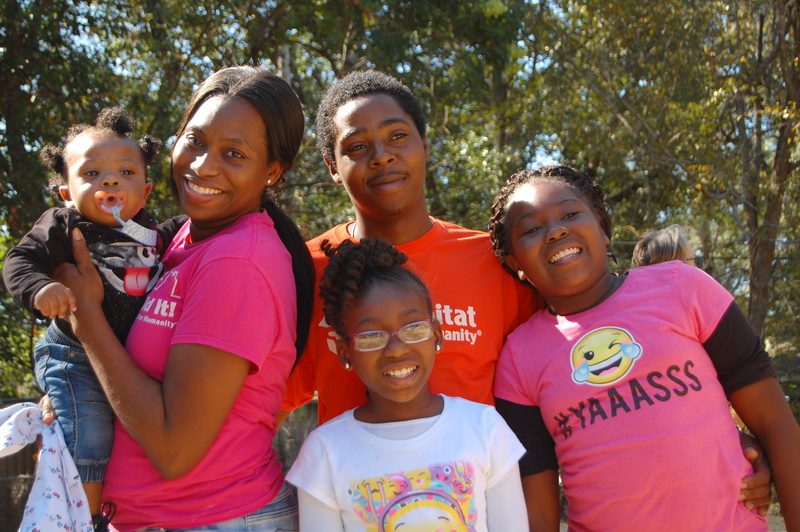 Jasmine lives in Gainesville with her children Aniyha, Akira, and Litton, Jr. She heard of the Habitat program through her aunt, who lived in a Habitat home herself.Jasmine and her children lived in a house with mold and mildew issues, and with no insulation. 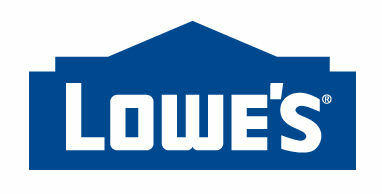 The house received 11 health code violations and has been deemed unlivable in its current condition. "A tree fell on the house one night," Jasmine explains. "It put holes in the roof, one being over the girls' room. So when it rained they got wet." Despite unsafe and unhealthy living conditions, Aniyha and Akira have proven to be just like their mother - hard-working and determined. Both girls love math and succeed in school. Aniyha serves as a school safety patrol and wants to be a teacher one day, while Akira hopes to be a lawyer. It was a life goal of Jasmine's to own a house by the time she turns 30 years old. Her new home is scheduled to be completed just before her 31st birthday and she could not be more excited. 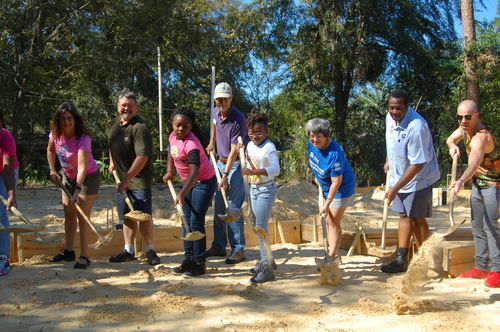 Jasmine looks forward to having a safe home for the girls while also getting to participate in the build process. The girls are most excited about their new rooms and having more space. As for baby Litton? He seems just overjoyed to be along for the ride. This is Alachua Women Build's 11th house and is known as the Toni Chiara Memorial House. 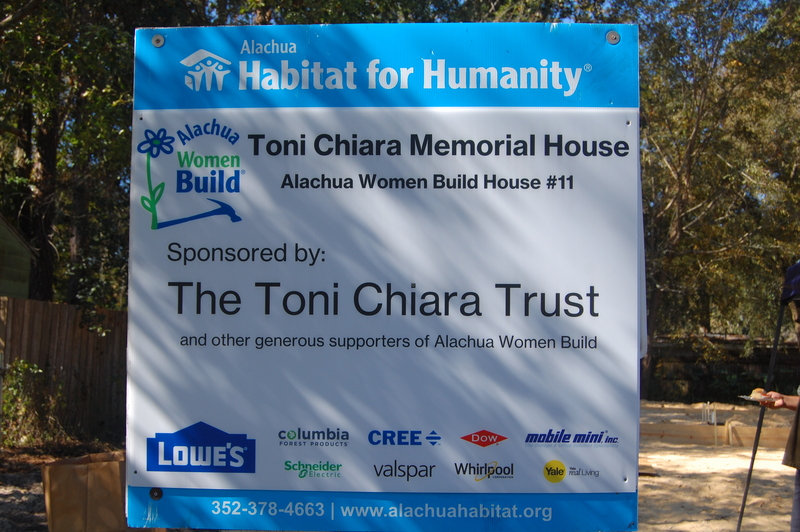 Toni Chiara was an integral part of Alachua Women Build, a program that mentors women of all ages and backgrounds in construction techniques while participating in a Habitat build. A very dedicated volunteer, Toni participated in builds on numerous Saturdays, served on the steering committee, and acted as site supervisor of Women Build House #4. 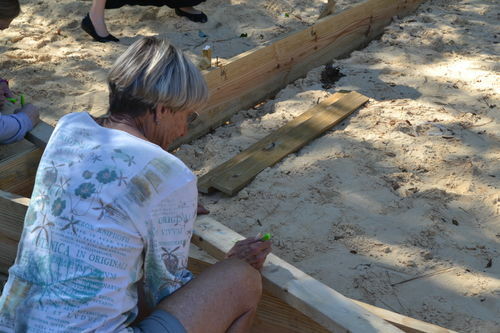 Toni was a tireless worker and excelled at whatever task she performed, whether on a Women Build site or in her professional work as a physical therapist and researcher at the VA.
Toni passed away in March 2016, leaving a generous contribution that allowed this 11th Women Build house to become a reality. 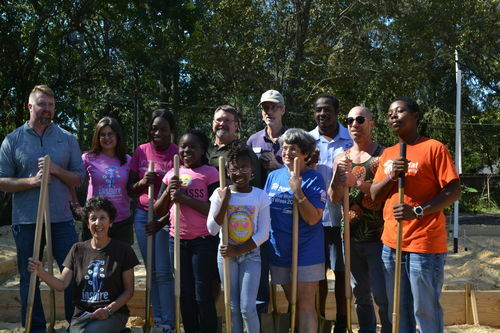 The Toni Chiara Memorial House is being built on a vacant, over-grown lot in northeast Gainesville. A previous house on the lot burned down one night about twelve years ago. 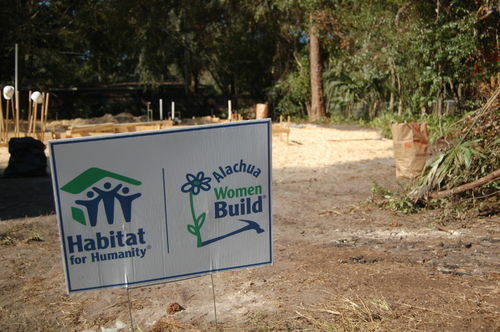 The neighbors are over-joyed that Habitat acquired the property and Jasmine and her family will move in, and Alachua Women Build is happy to be building a community as well as a home.